Love sour beers? Then today’s Drink of the Week is for you. 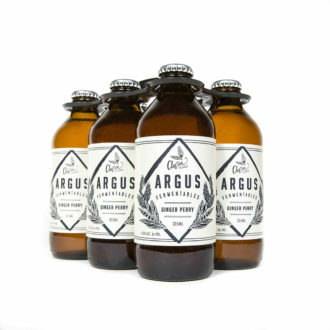 The latest release from Austin-based Argus Cidery, the Ginger Perry relies on the subtle nuances of pear for its fermentation. It’s soft and yeasty up front and quickly opens up with notes of pear, peaches and a hint of ginger spice, followed by a dry, extra-tart finish of bright lemon—all packaged up in an adorable stubby. And at a session-friendly 4.5% ABV, it’s a bottle you’ll want to enjoy well into summer. $10/6-pack, arguscidery.com for distribution info. Time to stock the cooler—Oktoberfest starts this weekend.